YOU WANT LESS. You want fewer distractions and less on your plate. The daily barrage of e-mails, texts, tweets, messages, and meetings distract you and stress you out. The simultaneous demands of work and family are taking a toll. And what s the cost? Second-rate work, missed deadlines, smaller paychecks, fewer promotions and lots of stress. AND YOU WANT MORE. You want more productivity from your work. More income for a better lifestyle. You want more satisfaction from life, and more time for yourself, your family, and your friends. NOW YOU CAN HAVE BOTH LESS AND MORE. In The ONE Thing, you ll learn to cut through the clutter achieve better results in less time build momentum toward your goal dial down the stress overcome that overwhelmed feeling revive your energy stay on track master what matters to you The ONE Thing delivers extraordinary results in every area of your life work, personal, family, and spiritual. 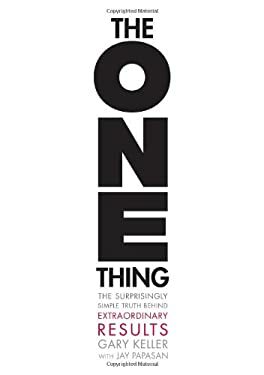 WHAT S YOUR ONE THING?